At least 45 workers and more than a dozen of their children have died so far. 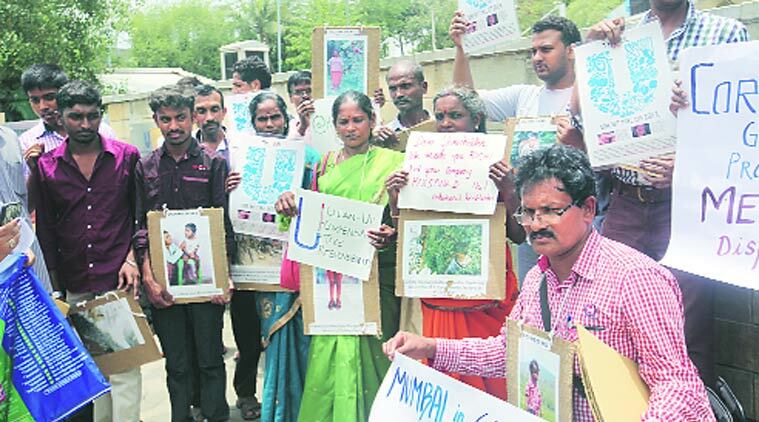 Villagers and former workers of the Hindustan Unilever Limited’s mercury thermometer factory in Kodaikanal, Tamil Nadu, Monday staged a peaceful demonstration outside the company headquarters in Andheri against the alleged mercury pollution caused by the factory. “Dear shareholders, we made you rich. Your company poisoned us,” read the placards held up by the 15-odd protesters agitating at the company entrance. They passed on the pamphlets to the shareholders arriving in five hired BEST buses. According to environmental activist Shweta Narayan, the factory — a second-hand unit set up in Kodaikanal in the 1980s — was shut down in March 2001 after allegations that it had dumped tonnes of toxic mercury wastes in a scrapyard in Kodaikanal, and in a nearby forest. “At least 45 workers and more than a dozen of their children have died so far; hundreds more are suffering from mercury-related diseases. A study released last week found high levels of toxic mercury in vegetation and sediments collected from the vicinity of Unilever’s factory. The study confirms that the contaminated factory site is polluting the air and leaking poisons into its surroundings, including the ecologically sensitive Pambar Shola and the Pambar river,” Narayan claimed. Among the protesters were Malarkodi and Bharatajyoti, who used to clean spilled mercury from the factory. While Malarkodi has serious brain and gynecological problems, is hard of hearing and suffers from nervous tremors, Bharatajyoti has suffered six miscarriages and her 20-year-old daughter has stunted growth and suffers from frequent epileptic fits, according to the protesters. “We are living proof that Unilever is not the responsible company it claims to be,” said S A Mahindran, president of the Pond’s HLL ex-Mercury Thermometer Workers Welfare Association, who was one of the protesters. Meanwhile, the company has denied the allegations. “Hindustan Unilever Limited (HUL) did not dump glass waste contaminated with mercury on land behind its factory. Scrap glass containing mercury had been sold to a scrap dealer about 3 km away from the factory. There were no adverse impacts on the health of employees or the environment. This has been confirmed by many independent studies,” said a company spokesperson.